Dirk Hartog was a Dutch seaman born in 1580. He spent his early career trading as a private merchant in the Baltic and Mediterranean seas before joining the Dutch East India Company (VOC) as a steersman. In 1615 he was appointed master of the VOC ship Eendracht and in January 1616 set sail with a fleet of VOC ships for Batavia (Jakarta, Indonesia) to trade in spices and other goods. Eendracht was separated from the fleet during a storm before the Cape of Good Hope but continued sailing about 7,000 km east before turning north and setting a course for Batavia. But Hartog sailed further east than he should have and made the first recorded landing of a European in Western Australia on 25 October 1616 when he dropped anchor off what is now known as Dirk Hartog Island. To record his visit for posterity Hartog climbed a cliff, now called Cape Inscription, and set a wooden post in a cleft of rock. He nailed to the post a pewter plate inscribed with a brief account of his visit. Hartog’s plate remained on the cliff for 81 years until rediscovered in 1697 by another VOC captain, Willem de Vlamingh. 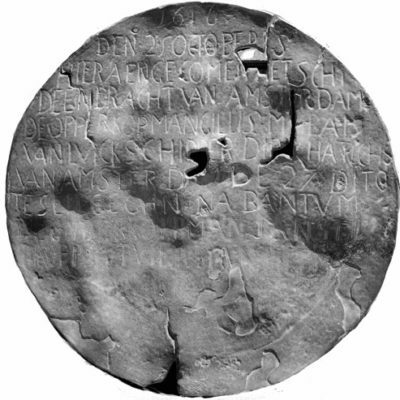 The oldest known physical record from Australia’s European history, the plate is now preserved in the Rijksmuseum in Amsterdam and the Cape Inscription area is included in Australia’s National Heritage List as a place of national significance. Hartog continued north charting along the way, and his name for the region – Landt van d’Eendracht, or Eendracht’s Land – began appearing on world maps.